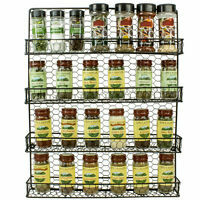 Organize your cabinets and drawers with the Seville Classics 3-Tier Expandable Bamboo Spice Rack Step Shelf Organizer. 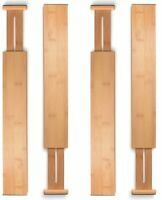 It's 3.3 inches high and can expand to a maximum width of 15 inches. This brown step shelf is made of solid bamboo and can be used in your bathroom, kitchen, or pantry to organize everything from spices to small jars. With a simple swipe of a damp cloth, you can clean the surface of this step shelf organizer. We put this to use the minute we unpacked it.....great quality and exactly as described. I use this to arrange my daily meds and the 3-tier arrangement really helps in seeing what you have and helps arrange them as used. Just an all around great product, I highly recommend for those specific needs. This looks exactly like the picture. I'm very satisfied with it. I like being able to make it smaller or larger, depending on what I'm displaying. Nice product just as the seller described. Had a issue with the delivery contacted the seller. They got back to me right away and fixed the problem. Seller resent the item and I received it very quickly with no issues. Great communication from the seller I will defiantly buy from them again. As described and great for the price; spacious and brings my seasonings to life!